The colorful, but dangerous, Sendai reactors. Photo from Japan Times. Despite the frenetic efforts of Japanese Prime Minister Shinzo Abe and his entire government to restart at least one of the nation’s shutdown reactors, if not dozens–not to mention similarly desperate efforts of Japanese nuclear utilities–Japan will once again this summer be entirely nuclear-free. 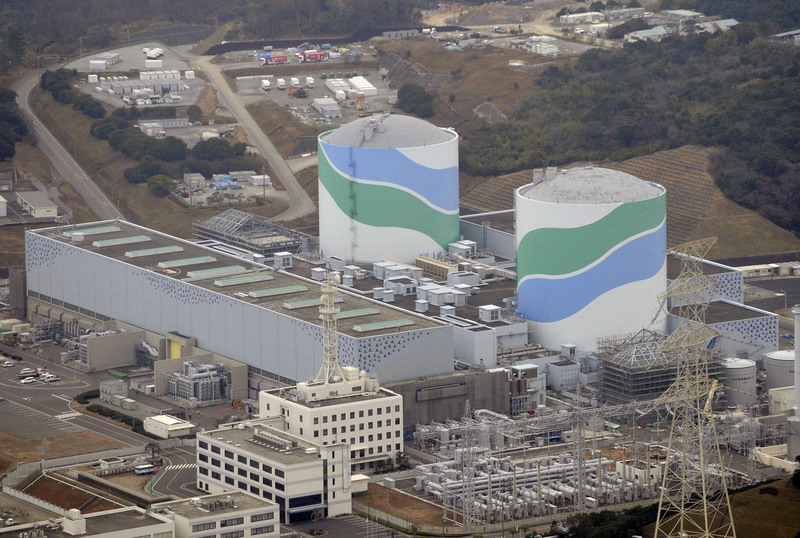 Kyushu Electric Power Co.’s Sendai reactors were chosen to lead the restart effort, but last week had to submit additional documentation to the country’s Nuclear Regulation Authority. The utility had submitted its initial documents in April, but the Authority found 42 flaws in the application, according to the Asahi Shimbun. Correcting those flaws took longer than the utility had planned and now the earliest the reactors can restart, given the regulatory process, is September. But besides the safety issues the application is meant to address, design and emergency procedure issues still have to be settled as well–meaning a September restart for the Sendai reactors is not a done deal. More than half of the people in Ichikikushikino, a town of 30,000 only three miles from Sendai, have signed a petition opposing restart of the reactors. The issue there is the failure of the utility and governments to establish workable evacuation plans–and whether any such plans could prove feasible. The area is served by three major highways, all of them normally congested. Some 210,000 live within the evacuation zone for the Sendai reactors. But the Nuclear Regulation Authority is attempting to wring its hands of any evacuation-related issues–a position not likely to be well-accepted by local residents. And so the battle over Japan’s energy future goes on–but the longer the country lives without its nuclear reactors, and the more renewable energy that is installed while the reactors are closed, the more clear it becomes that Japan simply doesn’t need them anymore, despite Prime Minister Abe’s protestations to the contrary. You can now support GreenWorld with your tax-deductible contribution on our new donation page here. We gratefully appreciate every donation of any size–your support is what makes our work possible. Comments are welcome on all GreenWorld posts! Say your piece above. Start a discussion. Don’t be shy; this blog is for you. If you like GreenWorld, you can help us reach more people. Just use the icons below to “like” our posts and to share them on the various social networking sites you use. And if you don’t like GreenWorld, please let us know that too. Send an e-mail with your comments/complaints/compliments to nirs@nirs.org. Thank you! Note: If you’d like to receive GreenWorld via e-mail daily, send your name and e-mail address to nirs@nirs.org and we’ll send you an invitation. Note that the invitation will come from a GreenWorld@wordpress.com address and not a nirs.org address, so watch for it. Please, please, don’t start them up again… EVER! One horrible, extinction causing event is enough. Oh wait, there’s more than one happening now… WIPP, Hanford, etc. [?] . Do we even know how many are leaking? Renewables are such a safer, healthier choice… for the entire world. The only real reason to start Japans reactors is so the employees that work there can have their jobs again. Pathetic. Japan’s country flag is; The land of the rising Sun. Like Mr. Mariotte said, ” the longer the reactors are off, the more opportunity for renewable energy to replace the nukies”. MAY IT BE SO!! !